How to Learn Easily and Successfully? At every stage of life, man crave to learn. despite of the area of expertise, he still wants to learn something in some way. In life of a student, learning matters a lot. They learn new things everyday, which might or might not be included in their course, new concepts, new ideas, new experiences, and a lot of new things in order to manage the good grades. The first teacher of a child is his Mother. If a child is brought up in a good way, is taught to learn the things from the very beginning, is given a good diet, then he would have a good memory. A good and healthy diet matters a lot. If our diet is not good in providing the necessary vitamins and nutrients then it would have negative impact on our memories. Stress, smoking, drugs and lack of exercise alter the activities of mind in a negative fashion. We all agree to this fact that each of us has to learn in order to move on in life. Those who would learn in a way better than others would surely be ahead of others no matter they are students, businessmen, officers, clerks etc. So, aint it better if a person is learning he should learn in such a way that the thing he learns remains in his mind for a long span. This would be helpful to him in many ways. For example if a student prepares a test and after taking that test he forgets what he learned two or three days back and if again he have to take the test he have to learn the topics again. On the other hand a student learns the topic in such a way that he remembers them after the test then in case of another test he would prepare for the test in much lesser time. So basically in this article we'll see how can we learn in a better way and how can we memorize the things for a long span of time. Sensory memory is an ultra-short-term memory and decays or degrades very quickly, typically in the region of 200 - 500 milliseconds (1/5 - 1/2 second) after the perception of an item, and certainly less than a second. For example, the ability to look at something and remember what it looked like with just a second of observation is an example of sensory memory. Information is passed from the sensory memory into short-term memory via the process of attention. 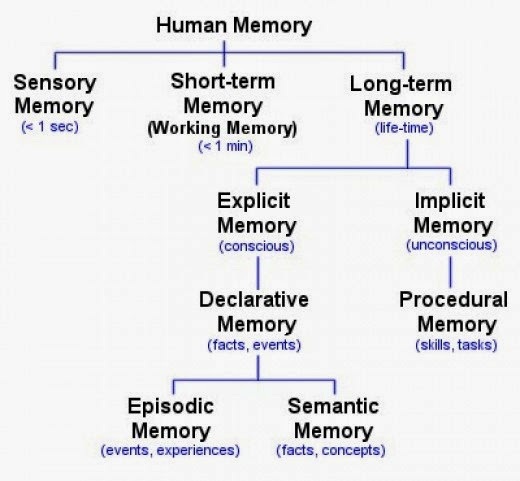 Short Term Memory is the memory type where you store the information for very short time before either dismissing it or transferring it to long-term memory. Although it sounds complicated, this process takes your short-term memory less than a minute to complete. For example, it is helping you right now by storing information from the beginning of this sentence, so that you can make sense of the end of it. 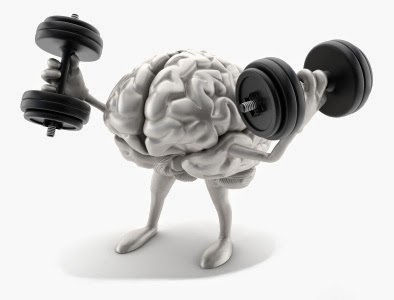 As we grow older, the amount of time our short-term memory can store information becomes shorter and shorter.short-term memory is a necessary step toward the next stage of retention, long-term memory. Long-term memory is, obviously enough, intended for storage of information over a long period of time. Despite our everyday impressions of forgetting, it seems likely that long-term memory actually decays very little over time, and can store a seemingly unlimited amount of information almost indefinitely. Indeed, there is some debate as to whether we actually ever “forget” anything at all, or whether it just becomes increasingly difficult to access or retrieve certain items from memory. Short-term memories can become long-term memory through the process of consolidation, involving rehearsal and meaningful association. How to remember things for a longer time? The problem with short-term memory is that it’s, well, short-term. The phonological loop component of working memory(short term memory) can only hold something in our “mind’s ear” for a few seconds. As soon as we dial the phone number, it’s forgotten, because we stop repeating it in our mind. If you want to retain the number longer, you have to do something more. One of the ways to transfer information (like a telephone number) from your mind’s ear to your long-term memory is to return to it again and again. Repetition’s ability to consolidate knowledge in long-term memory works not just for declarative memory — memory of facts and events — but also for procedural knowledge of skills such as remembering how to use a computer mouse or how to dial a cell phone while driving. Moreover, the most recent research indicates that these bits of information our brain pays special attention to during the day will also be rehearsed at night when we’re asleep. So in addition to performing “live” repetitions of knowledge or a skill, our brain rehearses things offline as well. Neuroscientists have only recently figured out how the brain forgets most of the data flooding through our minds every second of every day, and yet allows us to remember those things that we practice and rehearse. But it’s important to bear in mind that consolidation of knowledge in long-term memory does not guarantee it will stay there forever. If the same phone number is dialed every day, it will be memorized for the time being. But stop dialing it for any length of time and it’s back to the phone book again. Cramming can work well if all you’re worried about is passing the test. But it won’t help much if you want to recall that knowledge a year later. In order to retain access to most factual knowledge, we must remind ourselves of the details, and use them, on an ongoing basis. Suppose we are asked to learn a chapter of 20 pages in one day. What most of us will do is that they will start and finish the entire chapter is a single run. The result is that they get the things mixed and forget most of the material after a few hours. This is because the information you learned this way was stored at different places and and it becomes hard for the brain to connect the links between all these places after some time if not revised. Being more specific we people forget the things once we appear in the test and even before the test too. We should not cover the 20 pages in a single run rather we should divide the chapter into parts. Let's say we divide it into 5 parts i.e. 4 pages each part. We have 24 hours to cover the 20 pages. Start with the first part consisting of 4 pages. Once you are done with this part take a break of half an hour or an hour. When you return first of all revise the first part and then move on to the second one. Again after completing this part have a break.Again On return first revise first two parts and then go for the 3rd part. And continue this until you are done with the entire chapter. 1st part - 4 times revised. Now after this much revision the information of first three or two parts would be connected together and it would be easy to retrieve to this information after some gaps. And for other parts you can have revision skipping the first 2 or 3 parts. During preparation if you feel that you have learned some portion and wont forget it then you can skip that during preparation and move with other portions. This method seem to be difficult but once you'll get used to it it will be much helpful for you. Once you have prepared in this way the much strong links would be established between different parts of the brain where the information is stored and if you will keep on revising this information from time to time it will be permanently imprinted in the mind. Study at your “peak” time of day. Some people work better in the morning, others at night. Find out which type you are by noting the time of day while paying attention to your level of energy and interest in studying. Sleep helps consolidate memory. Study throughout the days leading up to an exam. Avoid cramming the night before.Take breaks while studying. Go for a walk, eat a snack, or stretch to refresh your brain. Associate what you're trying to learn with what you already know.Connect the unfamiliar to things that are already familiar to you. Ex: Trying to memorize the Spanish word for fiesta (meaning ‘party’)? You can connect it to the English word “festive,” which means cheerful and celebratory—definite aspects of any good party! Write out facts to be memorized over and over and over. Making lists and categories will help you recall what certain information means to you, and why that information is important. Ex: if you have multiple names of bacteria that need memorizing, sort them in a list and giving each species name a quick definition. Mount this list on a wall for quick everyday access. When reading information, summarize the main facts.Read a chapter of a book and mark the big ideas and important details. This practice requires you to think about what you're reading, recycle it, and teach it to yourself again. If you are to learn the meanings of the words or you are to learn a list of words(or something else) then formulate a funny story using the given words. This will help you remember those words for a longer time. Basically its all about practice. The more you practice, the more you revise , the more closer you will be to the betterment. Look for the faults in you and then correct them as soon as possible. Those of you who aren't following the above mentioned points should try to give them a try. I am sure if once you will be successful in building up your routine according to the above mentioned method, you will be following the same method throughout your life. This method is helpful at all levels, in schools, in colleges, in professional institutes and in higher studies also. So give it a try at-least once. "...but not everyone who works hard is a successful person."